March | 2010 | J.J. McLellan & Son "
Congratulations to our Door Prize Winners! Thank you to everyone who stopped by our booth last night at the Wellington North Business Showcase. We enjoyed talking to you, sharing our information and look forward to serving you in the future. CONGRATULATIONS to our door prize winners!!! Joan Speer of Mount Forest won the Programmable Thermostat – It is a Robertshaw Universal Control Programmable Thermostat with a 5 year warranty! Congrats to you Joan and thank you for stopping by our booth! Marilyn Robinson of Mount Forest won the Carbon Monoxide Alarm – It is a Senco Safe at Home Carbon Monoxide Alarm with a 6 year warranty! Congrats to you as well Marilyn and thank you for stopping by our booth! Wellington North Business Showcase – Next Tuesday! Next Tuesday March 30th is the Wellington North Business Showcase at the Mount Forest Arena. Check out the Mount Forest Confederate for details of the event. Come out and support your local business community and see what the local businesses have to offer! So I came home from work the other day and found this little package simply hanging from our door knob handle. It was telling us that our Smart Meter had been installed and that at this time nothing would change. Last evening I was reading through the package and it gave some very helpful and smart changes you can make to save energy and therefore save money! Your electric appliances are now going to cost you more. Especially since you use most of them in the peak hours – such as your stove, hot water heater, lights and heat. It would be difficult to change to eat at either 4pm or 10pm at night. However… there are somethings you can do to help with this! Install a Gas Stove, replace your electric hot water heater with a gas hot water heater, update your light bulbs (for that you just go to the hardware store 😉 ), update your heating system. Although some of these can be quite expensive, with the Home Energy Audit you can recover some of your costs through Government Rebates! Consider taking advantage of the Home Energy Audit to benefit from the savings! 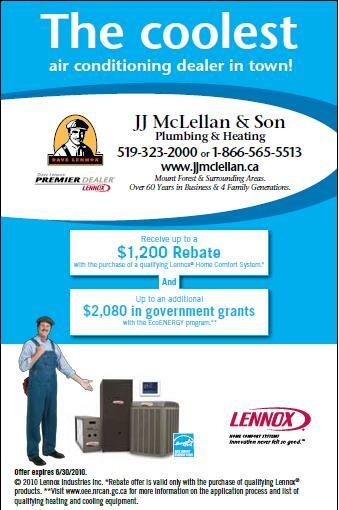 Lennox Spring Ad – Watch for it in your local paper! Receive a $1200 rebate from Lennox with the purchase of a Lennox Home Comfort System. Also you can save up to an additional $2080 with the EcoEnergy Audit! To book an Energy Audit for our area please call 1-888-380-7337! Watch for our ad’s in our local papers, BizBull, Mount Forest Confederate and Wellington Advertiser, over the next couple of months. Give us a call at 519-323-2000 or 1-866-565-5513 for your FREE estimate! Come and check out your local businesses ! Tastes of Wellington North… 4pm – 8pm – A Sample-Fest of tastes and treats from a variety of vendors all grown, produced or prepared in Wellington North! A few nice words go a long way! We have been blessed over the years with many great and loyal customers who we greatly appreciate. Its always nice to receive feedback regarding our business and services, both positive and negative as its the only way we can continue to strive to provide top quality service for our current and future customers. Over the past couple weeks we received a couple calls which instantly brought a smile to our faces. Its not everyday that someone will pick up the phone to call and let us know just how happy they were with our service – so when we get a phone call like this it is greatly appreciated! Here are a few testimonials which we received over the past few weeks. Of course we always love to hear your feedback… check out the website www.jjmclellan.ca (which will be getting a face lift in the near future) to drop me a line about your experience with JJ McLellan & Son! We were very happy with the technician that attended our home on Saturday to service our hot water heater. The technician was extremely polite, did an excellent job and was great to deal with! Dennis was very impressed with our timely service when they found themselves with a 20+ year old furnace which was suddenly inoperable. As Dennis said, our technicians came in, got the job done and even worked past 6pm on a Friday to complete the new furance installation and ensure the couple had heat for the weekend! Gordon called our shop and asked if we wanted to hear any complaints, he was politely told no with a little chuckle. His response was phenominal! Gordon said he had absolutely nothing to complain about. He said our 3 technicians did a wonderful job, he was very impressed with them and would certainly be using more of our services in the future.